With the falling leaves and cooler nights that come with the end of summer, it’s best to already have your home prepared for the next season. Follow these seven tips to get your home ready for fall. Tending to your lawn in fall is one of the best ways to help your grass during the coldest winter months. Make it a point to fertilize your lawn so that it has some extra nutrients before winter hits. Fall weather typically means a rest for your air conditioner. If you live in a climate that allows you to put your AC to rest during these months, use late summer to get your AC serviced before you stop using it. By cleaning the coils, changing the filters, and performing general maintenance on your air conditioning, you’ll be ready to welcome the hot summer days when they roll around again. Having clean gutters helps protect your home from the water damage that clogged gutters can cause. Make it a point to keep your gutters clean throughout the foliage-heavy months of fall to keep your home in its best shape. 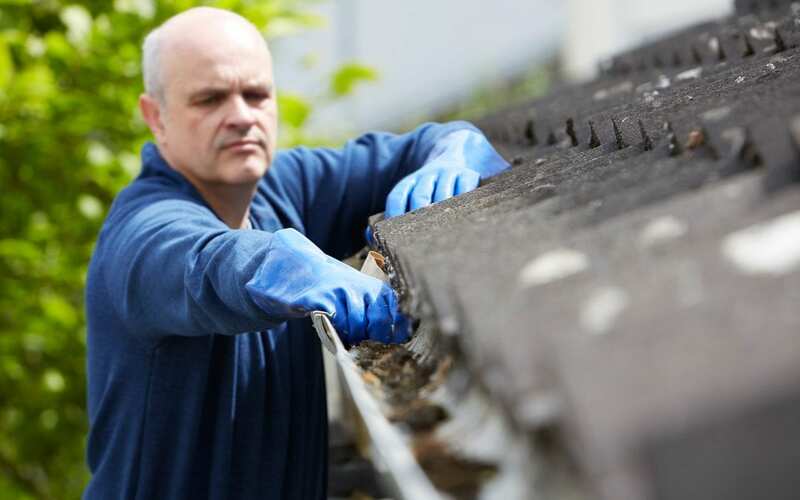 Either do it yourself or hire a pro–the effort to clean your gutters will be worth it. As you get deeper into fall, you’ll likely want to use your fireplace. However, you definitely don’t want to fill your home with smoke, soot, or carbon monoxide. Make it a point to clean your chimney now to prevent any accidents or dangerous situations when it is time to use the fireplace. Similarly, the chimney of gas fireplaces should be inspected to check for squirrel or bird nests that can block the flue. Be sure to check the chimney pipe for cracks. Don’t wait for the cold weather to come for you to properly seal your home. Use caulk to make sure any gaps between windows and doors are properly sealed. This will help you cut back on heating costs during the fall and winter, and keep you as warm as possible. The end of summer is the last chance you have to address any roof issues before the cold and wet seasons cause problems. Now is the best time to take care of any roof repairs before more damage occurs. Take the time to inspect your roof for any damage or leaks, or have a professional inspect it for you. If you notice that your roof is compromised, get everything fixed as soon as possible. When planning for the colder months, you’ll want to make sure you have the right tools ready. Take inventory of your current tools. Have you lost anything or damaged any tools? Replace or purchase the new tools now that you will need later in the fall and winter. Getting your home ready for fall starts now. Use these seven tips to make sure you are properly prepared. Precision Home Inspectors serves Hampton Roads of Virginia and the surrounding areas with home inspection services. Contact us to book an appointment.